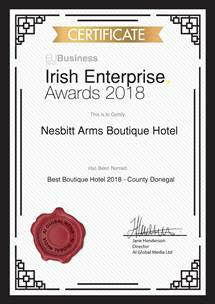 The Nesbitt Arms is a charming family run boutique hotel located in the heart of County Donegal. Centrally located in the Heritage Town of Ardara, nestled in a valley surrounded by magnificent scenery on Donegal’s Wild Atlantic Way. The hotel, steeped in history, was established in 1838 and has evolved over the years to a beautiful 49 en-suite bedroom hotel. 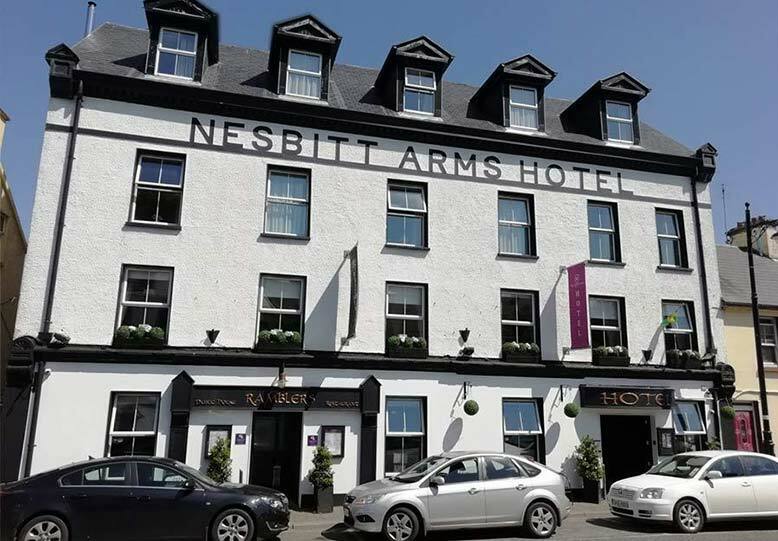 Few hotels in Donegal can match the idyllic location the Nesbitt Arms has to offer, making it the perfect base to discover the beauty of County Donegal. Take the staggeringly beautiful drive through the Glengesh Pass to the peaceful and picturesque town of Glencolmcille. Explore the rugged Atlantic coastline, take a walk on one of our many local beaches or take in the breathtaking views from the top of Slieve League, Europe’s highest marine cliffs. The Nesbitt Arms is only an hour’s drive from the second largest National Park in Ireland, Glenveagh. There are many attractions and activities in the locality to suit all visitors. The old world charm of The Nesbitt Arms will captivate you instantly. The Hotel has been fully refurbished in the last year and boasts warm welcoming shades, beautiful tweeds and fabrics which offer our guests the best of both worlds – Traditional Irish warmth with a modern twist. The Nesbitt Arms is renowned for its excellent reputation for quality food, friendly service and comfortable accommodation. Our gracious hospitality and true Irish spirit win the hearts of locals and visitors alike. Whether on holiday, celebrating a wedding, family occasion or treating yourself to our delicious food in Ramblers Bar & Restaurant, sit back and enjoy the unique and friendly atmosphere we have to offer.